The AVerVision U50 USB visualizer features exceptional portability and convenience as well as the ability to run solely off power from the computer. The lag-free 30fps frame rate, 5-megapixel camera sensor, HD1080p output resolution and built-in microphone make it an excellent choice during video chats. Easily integrate U50 with an interactive whiteboard (IWB) via the AVerVision Flash Plug-in, or use A+ Plug-in for PowerPoint to capture high-quality visualizer images, record live video and audio. Hassle-free live HD imaging - Show vivid, blur-free 30fps live video at HD1080p that will dazzle any audience, while utilizing the visualizer’s wide shooting area and long exible arm to easily capture complete images of documents & objects larger than an A4 sheet of paper. Handy USB hub for tech integration - Turn U50 and its 3 built-in USB ports into a hub for your classroom technology. Connect your visualizer easily to your computer via U50’s mini USB port, while using U50’s two additional USB ports to connect an IWB, wireless mouse or other USB device. 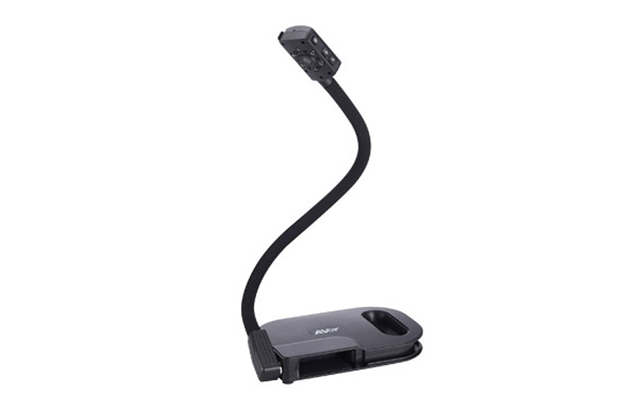 Compact and portable design - Bring your U50 visualizer along with you wherever you go thanks to a lightweight design, a flexible arm and camera head that eortlessly slip into the visualizer’s frame and a built-in handle for easy toting.